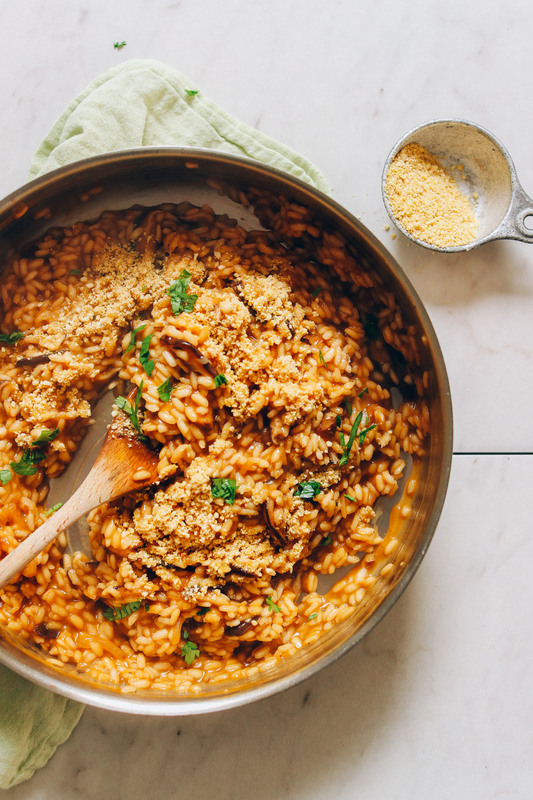 When you’re craving carbs and comfort, risotto is your dish. 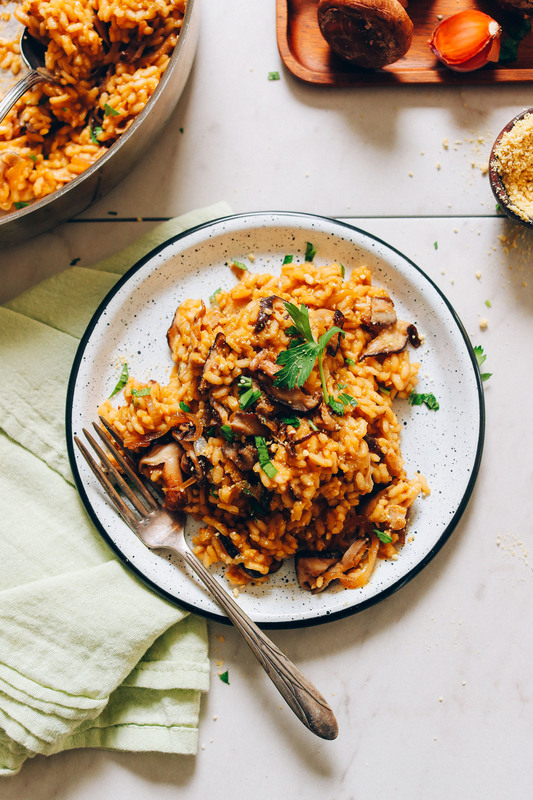 We’ve made risotto a couple times for the blog before and you all seem to love it. 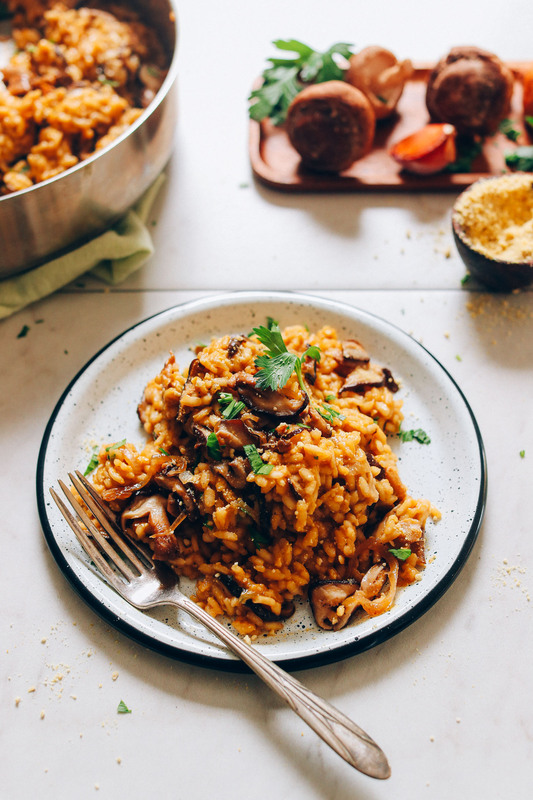 So, with my newfound love for caramelized mushrooms, I couldn’t have imagined a better way to serve up a new spin on risotto. Shall we? The base for this 10-ingredient, 30-minute recipe starts with warmed vegetable broth, which you can make yourself (for the win), or just grab some store-bought (our favorite brand is Imagine). Next come shallot and shiitake mushrooms, which are sautéed until golden brown. Ideally, the mushrooms start to dry out a little and become deep golden brown and caramelized for the ultimate hearty mushroom flavor. 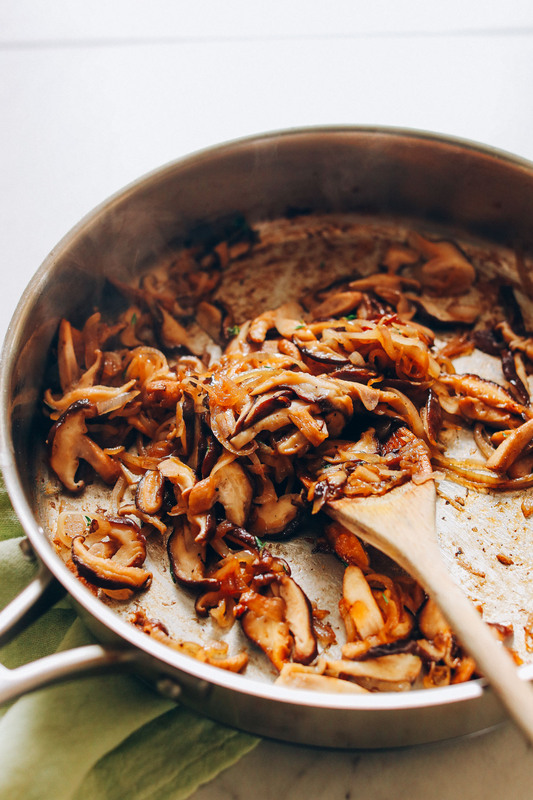 Caramelization happens when the mushrooms have plenty of space to touch the pan without overlapping, so use your largest pan or pot to ensure they have plenty of room to swim. Once caramelized, it’s time to add your rice, some white wine, and fresh herbs. This is where the flavor begins to really develop. Lastly, add vegetable broth a little at a time, keeping a consistent low simmer and stirring frequently until the rice achieves an “al dente” texture – soft with a little bite. Once the rice is done, turn the heat off, add your vegan parmesan cheese (or just some nutritional yeast or other vegan cheese of choice), and stir to combine. Mmm – cheesy, hearty carbs. This would make a great weeknight meal when you’re craving something comforting and nourishing and need it on the table fast. It would also be great for hosting, especially when paired with something like our Best Vegan Meatballs, Best Whole Roasted Cauliflower, Vegan Ricotta Sun-dried Tomato & Pesto Salad, and your favorite red or white wine. If you’re into risotto, also be sure to check out our Mushroom & Leek Risotto, and Creamy Vegetable Risotto! 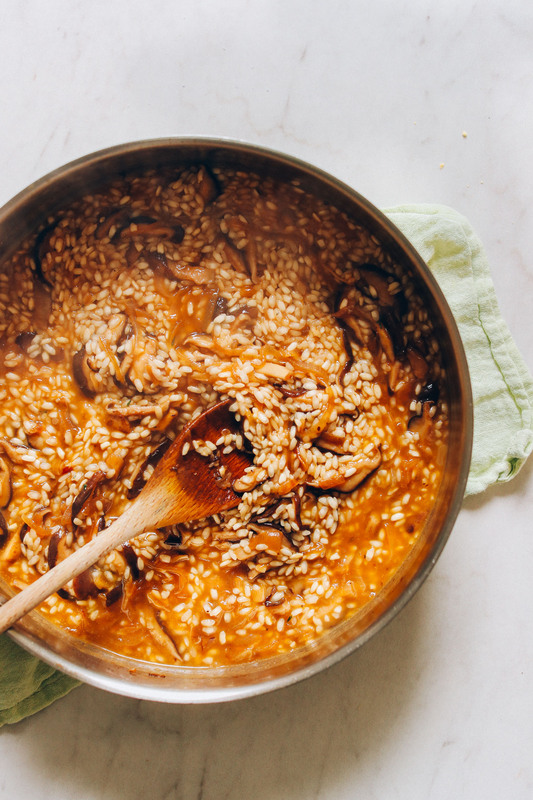 Easy-to-make vegan risotto infused with sautéed shallot and caramelized shiitake mushrooms! Hearty, flavorful, and incredibly satisfying. In a medium saucepan, heat vegetable broth over medium heat. Once simmering, reduce heat to low to keep warm. In the meantime, heat a large pan* over medium heat. Once hot, add oil and shallot and season with a pinch of salt and pepper. Sauté for 3-4 minutes - stirring frequently. 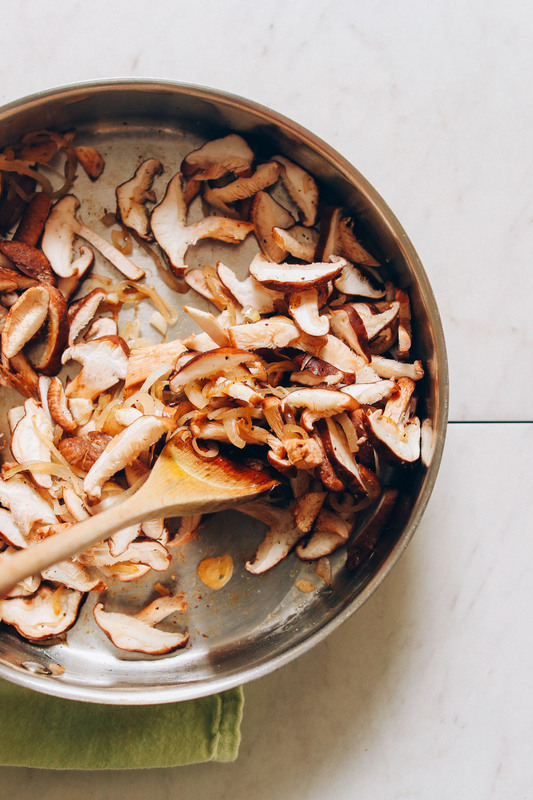 Then add mushrooms and coconut aminos and continue sautéing until the mushrooms are golden brown and caramelized. Optional: remove some of the shiitake mushrooms from the pan and reserve for serving - not necessary, but it makes a nice garnish. Add the thyme and arborio rice and cook for 1 minute, stirring occasionally. Then add dry white wine and stir gently. Cook for 2 minutes or until the liquid is mostly absorbed. Using a ladle, add warmed vegetable stock 1/2 cup (120 ml) at a time, stirring almost constantly, giving the risotto little breaks to come back to a simmer. The heat should be medium, and there should always be a slight simmer (adjust heat as needed). You want the mixture to be cooking consistently but not boiling or it can get gummy and cook too quickly. Continue to add vegetable stock 1 ladle at a time, stirring to incorporate, until the rice is 'al dente' - cooked through but still has a slight bite. This whole process should take about 15-20 minutes. Once the rice is cooked through and al dente, remove from heat and add vegan parmesan cheese. Stir to coat (see photo). Taste and adjust flavor as needed, adding sea salt and pepper to taste or more vegan parmesan to enhance the cheesiness. If dry at this point, add a little more warmed broth. 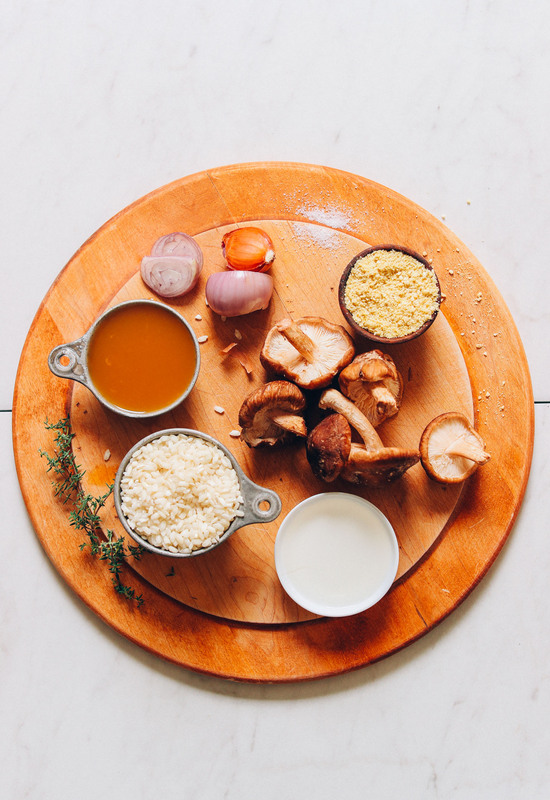 To serve, divide between serving bowls and top with reserved mushrooms, additional vegan parmesan cheese, and a sprinkle of fresh parsley (all optional). Best when fresh, though leftovers will keep covered in the refrigerator for 4-5 days or in the freezer up to 1 month. Reheat on the stovetop with additional (warmed) vegetable broth until hot. *Caramelization happens when the mushrooms have plenty of space to touch the pan without overlapping, so use your largest pan or pot to ensure they have plenty of room to swim. *Recipe adapted from Food Network. *Nutrition information is a rough estimate for 1 of 4 servings calculated with oil, with lesser measurement of vegetable broth, and without optional ingredients. This deserves 10 stars! Fantastic dish that is full of flavor! We used portobello mushrooms instead of Shitake and it was still really good. Make this stat!! Made a version of this as – I could not find it when ready to cook – oops! But almost to the letter. I added a really amazing Sonomic almost vinegar, kind of a balsamic type of seasoning, yummy. I forgot the tamari or coconut aminos. It turned out fantastic, added some oven roasted asparagus. Thanks for this variation, will follow exactly next time and enjoy it your way! Had some shiitake I wanted to experiment with and I am sooo glad I tried this! Absolutely delicious, and I added some kale for more of a veggie boost! Perfect! Thanks for the recipe! I modified this for my electric pressure cooker and it was fantastic! I didn’t have white wine on hand, so I used 3.75c of hot veggie broth (the Better than Bullion No Chicken Base). I sauteed the onions for a few minutes before adding the shiitakes and then sauteed those for about 7 or 8 minutes. I used the 1/4c of nooch, a few shakes of black pepper, 2t thyme and 1t cracked rosemary. Once I stirred in the broth, I put the lid on and cooked it at high pressure for 5 minutes. Quick release and voila – delicious dinner before you know it! Yum! Thanks for sharing your modifications, Canice! How did you prepare the rice? I would love to try this instant pot idea. I loved this recipe! I used nooch in it, then sprinkled a little vegan parm on top when I served it. I didn’t have any veggie broth, so I used chicken, and I added a squeeze of lemon at the end, which really brought all the flavors together. I also tossed some frozen peas in at the end for a little extra vegetable action! (I also skipped the wine because I didn’t have any!) I had never made risotto before – it always seemed really fussy – but this was easy and delicious. Thanks! I may have shattered a full bottle of olive oil & flooded my bathroom while trying to get oil out of my clothes while cooking this, but at least I had delicious risotto to cheer me up! 5 stars for the recipe even when made by a 1 star human being. Our area has been hit with back back snowstorms, leaving us snowed in. I’ve been craving this recipe (made it in the past and the family has LOVED IT) but didn’t have everything one hand. I used vegan butter for the oil, yellow onion and garlic for the shallot, crimini mushrooms for the shiitake, Bragg’s liquid aminos instead of coconut, and left out the vegan cheese/nooch. I did use 4 cups of broth along as well as white wine. It turned out creamy and rich tasting. You really can’t go wrong with this recipe or slight variations of it. I did offer nooch on the side, for those in our fam who enjoy the flavor. Thanks for this wonderful recipe! Made this tonight, had a lovely flavour! Will definitely make it again, served it with tenderstem broccoli and baby asparagus on the side, was loved by the Mr and my mum who both are meat eaters, although are eating much less meat thanks to your great recipes! My partner hasn’t eaten meat for a month and even when he did buy a steak,he ended up feeding it to the dog! We’re so glad everyone enjoyed this recipe, Hannah! I made this tonight and my kids devoured the entire pan. Soooo good! Whoop! We’re glad to hear that, Emilia! HI just wondering if I can use basmati rice instead? 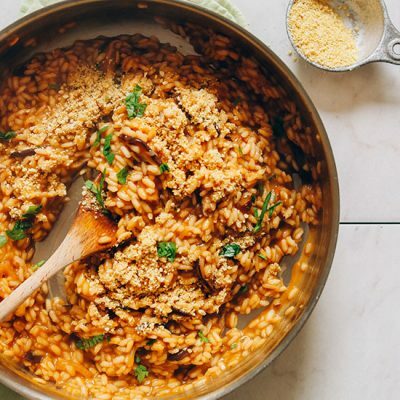 We highly recommend arborio rice for this recipe, but if you experiment with it, report back on how it goes. Good luck! I have NEVER made risotto, but this sounded delicious, so I gave it a try. What a delicious recipe–flavorful, fairly easy for my first attempt, and SO satisfying. I loved it. Thank you for sharing this. Seriously delicious! My husband hates mushrooms so I also added asparagus for hi but he kept going back for more mushrooms. He even said, “I just love these.” We didn’t even get left overs because he kept eating more. Definitely making it again but putting half away before he can get to it next time! This was absolutely amazing!! My non-vegan family loved it, and it was the hit of Christmas eve. This was my first time making risotto and it came out fabulous. Made this. I added 1/4 cup of go veggie vegan parmesan. I think it was too strong. I liked the taste better before I added it. I think I will make it without the vegan parmesan next time. Made this for a potluck and it was the favorite dish. Many people asked to take some home with them! Made it today for the second time. My husband doesn’t like mushrooms and devoured his share – even he thought it was totally delicious. I didn’t have dry white wine but the recipe was great even without it. Today I skipped on the vegan Parmesan also and it was still delicious. Will definitely make this again and again. I’ve just made this. Maybe it’s because I’m at 5200 ft above sea level, I had to put a lid on the rice while cooking so that it would become even al dente! And needed to cook about another 10-12 min. Otherwise, it tastes great! This was so easy and so delicious with a creamy nutty favour! I paired it with some steamed broccoli with lemon juice. I also doubled it so we would have leftovers. I feel like the original recipe is more like 2 serving. I made this last week and my husband and I LOVED it. Such depth of flavor and total comfort food while still being healthy. Next time I’ll double because we ate this all up and still wanted more! I’ve made this twice now; both times were successful and incredibly delicious! This is a new favorite for myself and my boyfriend. Thank you! I made this for dinner. I’ve never tried homemade risotto before as I had heard that it can be a little tricky. However, this dish was perfect. Texture of risotto was good, the caramelized mushrooms and shallots were delicious! It’s a keeper for our family. Thanks for the clear instructions. I LOVE mushrooms and this meal made me so happy, I can’t wait to make it again! I used a combo of shiitake and baby bellas. My first time trying risotto and it wasn’t as intimidating as I thought! It came together fairly quickly and dirtied few dishes, which is always a weeknight plus. I am not vegan so I did add a bit of regular parmesan cheese at the end, but I’m sure it would be delicious with nutritional yeast as well. I couldn’t believe how creamy and comforting risotto could be without all the butter/cheese. Thanks for another great recipe! I had a mushroom craving so we decided to try this recipe (first risotto we’ve made at home). We loved it so much, we went out the next day and bought more mushrooms to make it again. Definitely in our top five Minimalist recipes that we’ve tried. Forgot to add… we added 2 cloves garlic to it (because we love garlic) and that was great. Also, the second time we made it, we were out of thyme, so subbed rosemary, and that worked great as well. Excellent recipe and very forgiving, I might add. I intended to make it as written, using dried thyme. I went to shake just a little more toward the end and I dumped a bunch of black pepper in by accident! There was no turning back so we ate it and it still came out fantastic. I’ll definitely make this one again. So delicious! I put more mushrooms because that’s what I had. So filling. We made a whole meal out of it! My carnivorous husband loved it too. Followed the recipe exactly however; I did not have white wine, so just omitted it and it turned out wonderful. So good that I had to write my first review / comment ever! Love your blog and have made so many of your receipes. Thank you for the amazing GF and Vegan options! So glad you enjoyed this recipe, Jessica! Would I sub the white wine with something else if not using? Not sure I want to open a whole bottle for a small amount.. Thanks, can’t wait to make this! First time making risotto and it was fantastic! We were impressed by how much flavor and richness we were able to get in the risotto (and without any butter!). I ended up using regular parmesan cheese, but it was nice to have healthier ingredients for the rest of the recipe. Thanks for a great recipe- excited to make this one again! This recipe turned out absolutely delicious! I used baby Bella mushrooms instead and we loved it. The rice stirred up rich and creamy as it cooked in the skillet. I used the nutritional yeast option. Instead of coconut aminos, I used Braggs. I used vegetable broth for my sauteing and dried thyme. I omitted the wine. We would not have guessed it was vegan if I had not made it myself. This was my first time making a risotto. Thank you for the wonderful recipe. This. Is. Delicious!!! I made this yesterday for a dinner party. They were skeptical when I said I brought a vegan dish and boy did I prove them wrong. This was flavorful, smooth and had just enough bite to keep it interesting. I’m writing this review while eating the leftovers. I used the entire 4 cups of broth because I added some extra mushrooms and it was the perfect amount. I didn’t have vegan parmesan cheese so I added straight nutritional yeast and I highly recommend doing so!! You don’t need it, but it adds that extra nutty flavor that I love. Whoop! Thanks for sharing, Emily! Thanks, Dan!! We appreciate the review. This is my first ever recipe review…. I had to because this one was perfect! Risotto can be tricky (for me lol), but this made it easy. Great taste and texture! As we say in the south, GURRRRRRRL! 84-year-old mom loved it, 14-year-old son (very discriminating eater) loved it and the cook loved it! Next time I’m going to try rosemary instead of thyme, just for fun, but it was perfect as is. Whoop! We’re so glad to hear that, Elle! Going to make this tonight – thanks! Huge question: do you have or can you point me to any more kid palette friendly recipes? I want to transition them to our meals but I need advice on how to train their palettes… any advice would be greatly appreciated. Shucks, I don’t! And every kid is so different. I’d say let them have little bits of your main meal to get used to it, and then transition them more and more toward having just what you’re having. Hope that helps! If I make this a day ahead, what is the best way to store it and to reheat it? I’d recommend storing in the refrigerator and reheating in the microwave or in a small saucepan, adding more vegetable broth as needed to rehydrate. So easy and delicious! This will now be added to my routinal dinners. I’m craving more already!! Your recipes never ever disappoint! Delicious – my first risotto! Risotto took 30 minutes to cook. Whoop! We are glad your family enjoyed it! I loved this recipe! I found it to be simple and fairly quick to make and it definitely lived up to the comforting and creamy description. A perfect meal for a chilly fall evening. I will for sure make it again. This looks great! We make a wild mushroom and parsley risotto (get whatever selection we can from the farmers market) and that has always been a hit with guests. Never thought of doing it this way so thanks for the suggestion! Seriously, best risotto recipe I’ve ever made! My boyfriend who usually dislikes risotto, said this is the first one he ever liked! It’s just soooo tasty. Although it took a bit longer here for the arborio rice to get ready. I think it took me about 30 mins. Do dried Shitake once hydrated work in this recipe? Or is it best to go with fresh ? I’d say it’s best to go with fresh. But I’d suspect dry would work as well. Let us know if you give it a try! I bet adding the reconstituting liquid to the broth would be amazing. Happened to pick up some Shitake today whilst shopping then happened to see your recipe, so I thought I’d give it a go. So easy and so delicious. I always have to have something green on my plate so served with some steamed tenderstem broccoli. Added a knob of vegan butter right at the end to make it a bit more creamy and indulgent, used nooch for the cheesy twang. Another super easy, flavourful recipe to add to the collection. This recipe looks amazing and I can’t wait to try it. I came to your site because I was looking for some sort of mushroom recipe to put in tacos. The caramlized mushrooms would taste delicious in tacos. 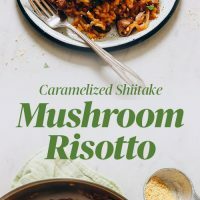 Do you think that after caramelizing the mushrooms I could make the risotto in an instant pot? Hi Erin! I haven’t tried making risotto in an instant pot, but I’m sure it’s possible. Let us know if you give that a try!